Well, he did it! Last week we told you about Jaux King and his plan to nab Guinness World Records glory by building and operating the world's largest pedal board. And Wednesday night, during a pre-Summer NAMM bash in downtown Nashville, King and his partner, Aljon Go, pulled it off. 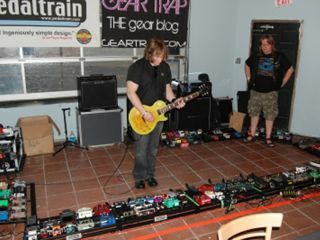 The pedalboard consisted of 142 different pedals, 13 loaded pedal boards and truckload of guitar cable. The device performed as expected, without any glitches or noise problems, before a crowd of approximately 300 invited industry professionals. "The night was a smashing success," says Jaux King, one of the founders of GearTrap.com. "We had a little bit of noise when we first fired it up last night, and it was a little worrisome. But we were able to reconfigure a few things and it all worked great. It actually sounded as good as my little setup at home. We had two noise suppressors in the chain and they made all the difference." King is hoping to get the pedalboard sanctioned by officials from Guinness. "Obviously, I have a ton of witnesses," he says. "There's a series of applications that we have to submit. But the good thing is, we're pretty much doing our own thing here. I heard about a guy who was trying to just turn on a bunch of pedals, but that's kind of bogus. Ours is a fully mounted consistent pedal board. Nobody's ever tried something like that before." Now that he's achieved one goal, King says he's already thinking big about next year. "We're already working on breaking our own record," he says. "We have an undisclosed goal in mind. Suffice to say, it's going to be ridiculously bigger than this year's board."